The Sydney Taylor Book Award honors new books for children and teens that exemplify the highest literary standards while portraying the Jewish experience. The award memorializes Sydney Taylor, author of the classic All-of-a-Kind Family series. Linda Glaser and Adam Gustavson will receive the 2013 gold medal in the Sydney Taylor Book Award's Younger Readers category for Hannah's Way, published by Kar-Ben, an imprint of Lerner Publishing. When Hannah's family relocates to rural Minnesota after her father loses his job, she is the only Jewish student in her class. Hannah worries she will not be able to attend a Saturday class picnic when her teacher arranges a carpool. Her observant family does not ride in cars on the Sabbath. In a delightful display of acceptance and friendship, the entire class chooses to walk with Hannah so she can attend the picnic. Barbara Krasner, a member of the Sydney Taylor Book Award Committee, said: "The Minnesota setting, the Depression timeframe, and a Jewish girl's dilemma all add up to a winning story." In 2011, Glaser received a Sydney Taylor Honor for her book, Emma's Poem: The Voice of the Statue of Liberty. The award in the Older Readers category will be presented to Louise Borden for His Name Was Raoul Wallenberg, published by Houghton Mifflin Books for Children. Written in verse, this biography of the Swedish humanitarian highlights his commitment to rescuing Jewish people in Budapest during World War II for readers aged eight to twelve. Teeming with photographs, Wallenberg's passion for helping others is dramatically portrayed. Committee Chair, Aimee Lurie commented: "His Name Was Raoul Wallenberg shows how the courageous actions of one person, despite tremendous obstacles, can make a difference. Louise Borden's well-researched biography will, without out a doubt, inspire children to perform acts of kindness and speak out against oppression." In 2006, Borden's The Journey that Saved Curious George: The True Wartime Escape of Margaret and H.A. Rey was a Sydney Taylor Honor Book for Younger Readers. Deborah Heiligman will receive the 2013 gold medal in the Sydney Taylor Book Award's Teen Readers category for Intentions, ﻿published by Knopf Books for Young Readers an imprint of Random House, Inc. The loss of innocence Rachel Greenberg, 16, experiences when the adults in her life -- including her parents, friends, and rabbi -- betray her trust and the relationship with her best friend crumbles is explored in this contemporary novel.﻿ Diane Rauchwerger, member of the Award Committee noted: "Rachel grows in her understanding and strength of character, while struggling with moral issues teens confront every day. Most importantly, she learns to forgive and to act with intention." Four Sydney Taylor Honor Books were named for 2013: The Elijah Door: A Passover Tale by Linda Leopold Strauss with illustrations by Alexi Natchev (Holiday House) and Zayde Comes To Live written by Sheri Sinykin and illustrated by Kristina Swarner (Peachtree Publishers) are recognized in the Younger Readers category. The Wooden Sword by Ann Redisch Stampler with illustrations by Carol Liddiment (Albert Whitman & Company) garnered recognition as an Honor Book for Older Readers. For Teen Readers, the honor goes to Beyond Courage: The Untold Story of Jewish Resistance During the Holocaust by Doreen Rappaport (Candlewick). In addition to the medal winners, the Award Committee designated thirteen Notable Books of Jewish Content for 2013. 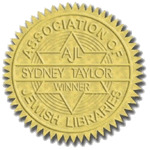 More information about the Sydney Taylor Book Award can be found at www.SydneyTaylorBookAward.org. It's enormous that you are getting thoughts from this paragraph as well as from our argument made here. that I stumbled across this during my search for something relating to this. I needed to ask. Does running a well-established website like yours take a massive amount work?